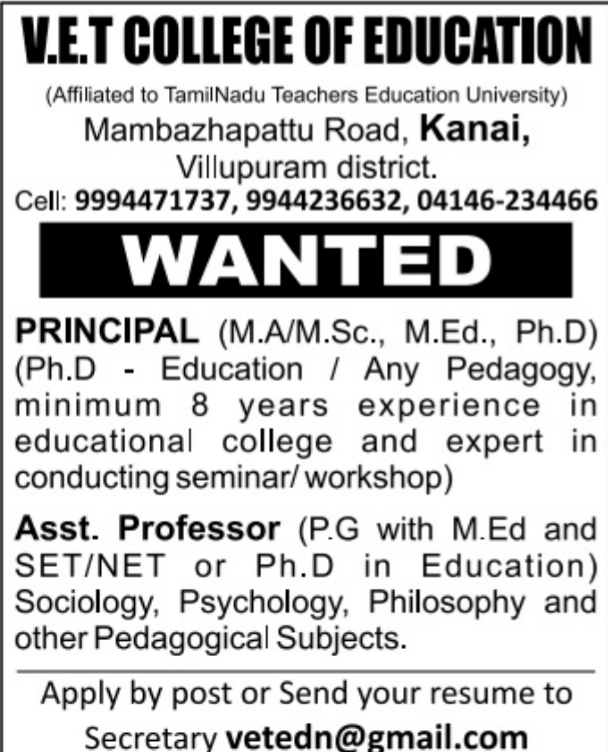 V.E.T College of Education,Villupuram has advertised in THE Dinamalar newspaper for recruitment of Principal / Assistant Professor jobs vacancies. Interested and eligible job aspirants are requested to apply immediately. Check out further more details below. Name of the College : V.E.T College of Education, Villupuram. About College: VET College of Education is situated in Villupuram district of Tamil Nadu. It was established under Vilupuram Educational Trust and managed by the same trust. VET College of Education is affiliated to Thiruvalluvar University, Vellore. It is approved by National Council for Teacher Education (NCTE), Bangalore, and recognized by the Government of Tamil Nadu. VET College of Education offers Bachelor in Education (B.Ed) course of 1 year duration. The college is aimed at bringing quality teacher to produce better education standards. It has well equipped labs and library where students can upgrade their knowledge. Minimum 8 years experience in educational college and expert in conducting seminar/workshop. 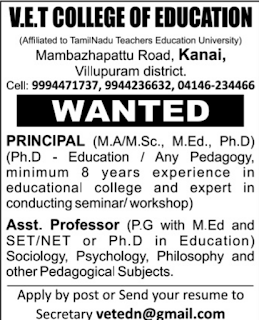 Asst.Professor: P.G with M.Ed and SET/NET or Ph.D in Education.